Do you have a student or client working on /r/? As a school SLP, I have … several. No matter how quickly I dismiss one, two more seem to spring up to take his place. There haven’t been a lot of apps that target just /r/, but I found one that I absolutely love! One of the things, I have learned about /r/ through several sources, is that many times what’s happening, particularly in vocalic /r/ (air, ear, ire, etc.) 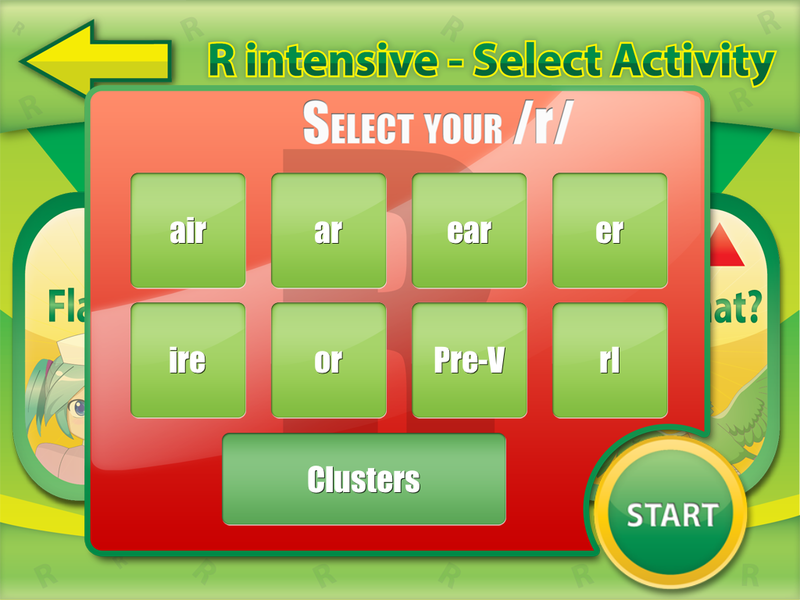 is the student often loses the vowel before the “err.” So in addition to the distorted /r/, there’s no vowel. Back when I started using apps for therapy on my iPod Touch (you know, before the iPad existed), there were very few apps devoted to /r/. Even fewer of those had vocalic /r/ separated by vowel. (If you don’t work on /r/ a lot, you’ll simply have to trust me – it’s important.) Way back at the beginning, Smarty Ears had developed R Intensive, and it was okay. I used it a bit, I liked it…it didn’t have a lot of bells and whistles (games, etc.) but it worked. Then…Smarty Ears redesigned the app! Let me tell you – it is amazing now! Once again, I am back to using it at least daily. But, don’t take my word for it…here’s the review and screen shots. Let me know what you think! The app starts off bright, clear, and themed as a hospital. 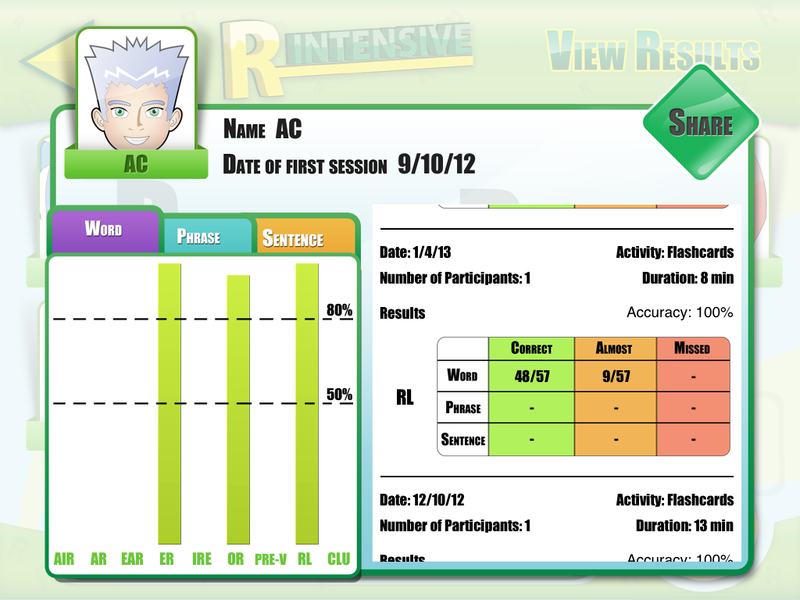 From here you have the choice of quick play (where no data is saved), Report Card (data), and Select Student. One of the truly fabulous things about this app now is that it is compatible with The Therapy Report Center so entering clients is even easier (not that it was ever hard) AND your data can be compiled all in one place so if you are using multiple Smarty Ears apps you don’t have to go searching for data for the same clients. 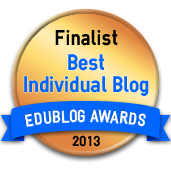 Once the student is selected, a decision must be made…which /r/ sound are we going to work on? As you can see, you have several choices, pick one – or more, the app doesn’t care. Data will be kept separately for each sound, so it’s okay. As the name implies it is just /r/…but really, as hard as /r/ can be to master, it’s okay to have its own dedicated app. There are 415 words that are available for your client to master. I LOVE that the app has its own /rl/ section. As someone who had to work on /r/ as kid, I can tell you /rl/ is TRICKY to master! Once the sound is picked, we have the choice of activity. It can be flashcards, a matching game, or “Guess What?” We’ll talk about Guess What in just a minute. Flashcard activities and matching activities don’t really need much explanation. However, both activities allow for the use of single words, phrases, and sentences. 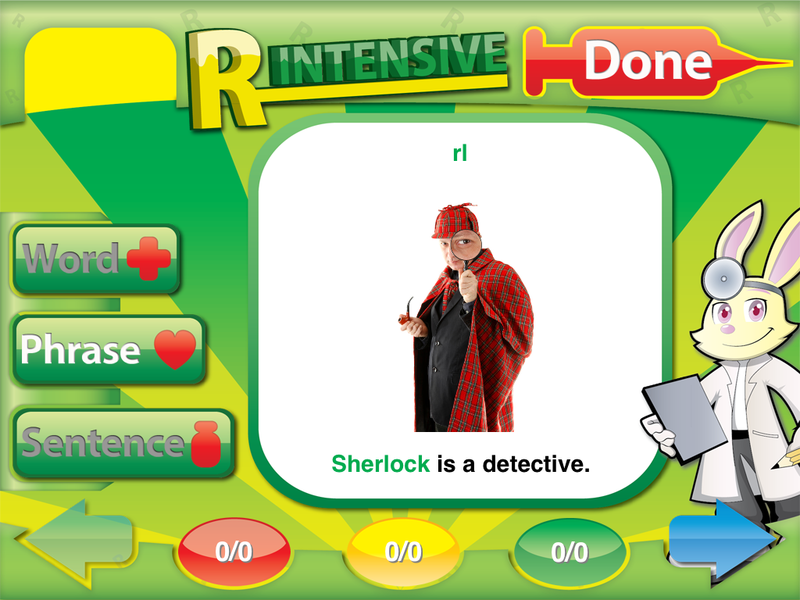 Here are some examples of the flashcard activity phrases and sentences. This is the sentence level pictures. It’s lengthy and complex. While this is the “phrase” sentence. Long enough to almost qualify for a sentence, but not nearly as complex. 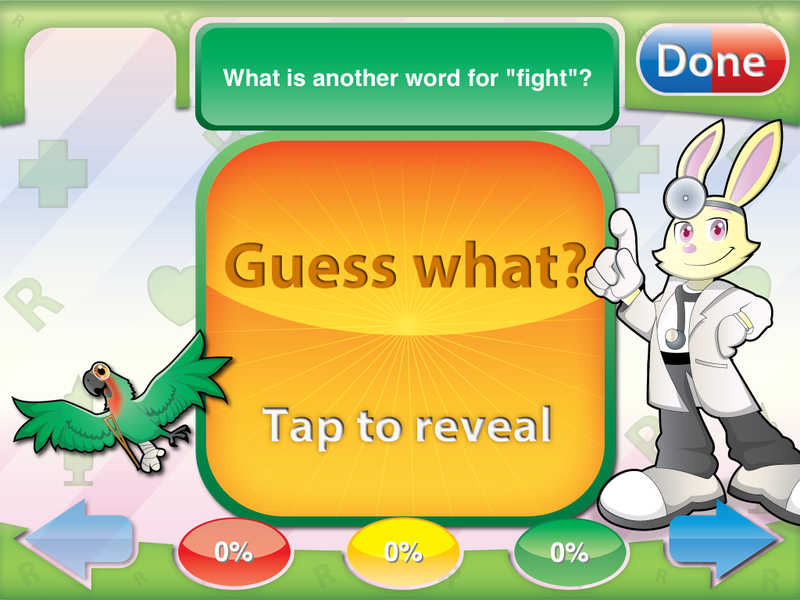 This picture is asking: What is another word for “fight”? Wait…all of a sudden we’re in language therapy – not just /r/ therapy? Who knew we could work on vocabulary while working on /r/! 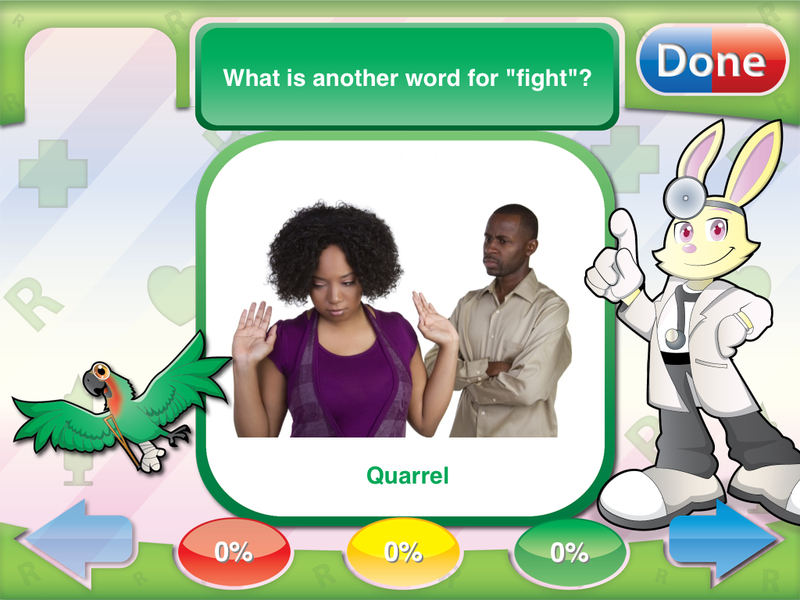 I absolutely love that this app can be used to enhance vocabulary. Would I use it as a sole vocabulary app? No, probably not, but if I can kill two birds with one stone, you can be sure I’m going to! In addition, because of the complexity of the game, this activity is great for helping with carry over and generalization. Of course, the app keeps great data. Separated by date of session, then further separated by sound, it gives a clear indication of percentage. Not only that, the app provides a bar graph with each sound. There’s a marker for 50% and 80% accuracy by phoneme. You can see at a glance which sounds are the trouble sounds. On the side there is a breakdown (by phoneme) and word/phrase/sentence level. In addition to the graph and numbers, there is “correct” “almost” and “missed.” These buttons are present on each screen. When the client is “correct” tap the green button. When it’s slightly distorted, tap the “almost” button, and when it is clearly distorted tap the “missed” button. Pros: I like the app. It is most definitely in my favorites folder on the iPad. I have used other apps that have a breakdown of /r/ available – but the pictures were not as good, or the sentences were not what I was looking for, or the data was simply not sufficient. This app gives me all I need to work on /r/ with any of my clients. Cons: Sometimes the “phrases” are too long to be true phrases. However, a quick carrier phrase fixes that problem, then we move to the longer phrases. The app gives a total number of words correct and almost (so 45/57 correct) I have to transfer that into a percentage. It’s not hard – but it would be nice if it were included for those of us that need percentages. I know the $20 price tag is off-putting for some SLPs, but for what this app does, it is money well spent! When I first bought it a few years ago, I thought so…now there is absolutely no doubt. The time saved in looking for materials, compiling data, etc. is worth far more than the price of the app. All in all…I highly recommend this app for any SLP working on /r/. I totally agree with you Mary, the update to R intensive is amazing! 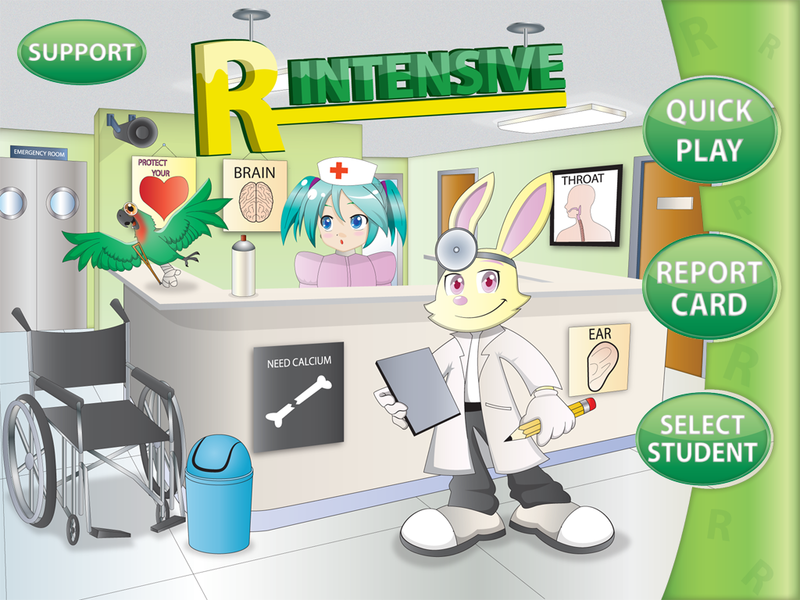 It has definitely become the go to app for my r students! I really like the guessing game because it targets language too! Love it too Mary. Since I work with K-3rd graders I don’t have as many kids working on /r/. But I still use this app for my language kids and keep data on if hey can label the picture, describe it, etc. I don’t know Kristen. I have forwarded your comment to the developer of R Intensive though. I’ll let you know what she says – unless she gets in touch with you directly. Kristen, I emailed the developer and was told they were not planning on updating the android market. I imagine it’s much like the old R intensive for IOS which is workable, but not nearly as nice as the updated version. I’m sorry for the bad news. I think it has something to do with so many android platforms and having to make it work with all of them and whatnot. I don’t know all the details. I already had this ap and like it also.